After enjoying Marrakech and its outlying regions a bit, we headed east into the desert to experience the glamorous Sahara. However, firstly, we stopped in Skoura as driving through Morocco, despite its size, can take a decent amount of time. Skoura is a small desert town in the province of Ouarzazate. It owes its popularity and population to its fertile environment as a result of being a natural oasis. For two days, we stayed at a small lodge called L’ma, which translates to water in Morocan Arabic. Owned and run by Belgian and French expatriates (or immigrants? Hard to say when to use that term with white people, you know? ), L’ma is another glamorous abode that caters to Westerners in an enclosed settlement that once was a local soccer field. It is a laidback establishment with wifi only really available in the main house where meals are also served. To be completely honest, it gives off a slight colonial vibe, which for some can be slightly unsettling. Nevertheless, the staff is very friendly. We even had the pleasure of cooking with them, which we were able to arrange beforehand. The lesson revolved around proper Moroccan rice, kefta (meat patties/balls), and tajine preparation. Yummy! Other amenities and activities include a swimming pool, donkeys and a horse to pet, a few lovely cats, and local bike tours that the owner can help arrange upon arrival. This accommodation is very much isolated, so you will not be actively engaging with many local Moroccans, mostly just French and Swedish visitors. It is a cute space, but for more adventurous travellers, a more open hotel or riad might be preferable. Along the way to the desert, there are multiple stops one can make to sample typical Moroccan wares and livelihoods. A nearby local is called Vallee des Roses (Valley of Roses) and specialises in rose-themed goods including water, perfumes, and other cosmetics. It is on the Road of 1000 Kasbahs, which as the name would suggest, is home to many little Kasbahs that house merchants and small eateries. It is a lovely drive, so do not rush through it even if the desert is one’s final destination. We arrived eventually in Merzouga, which is on the outskirts of the Sahara and the jumping off point for most desert excursions. 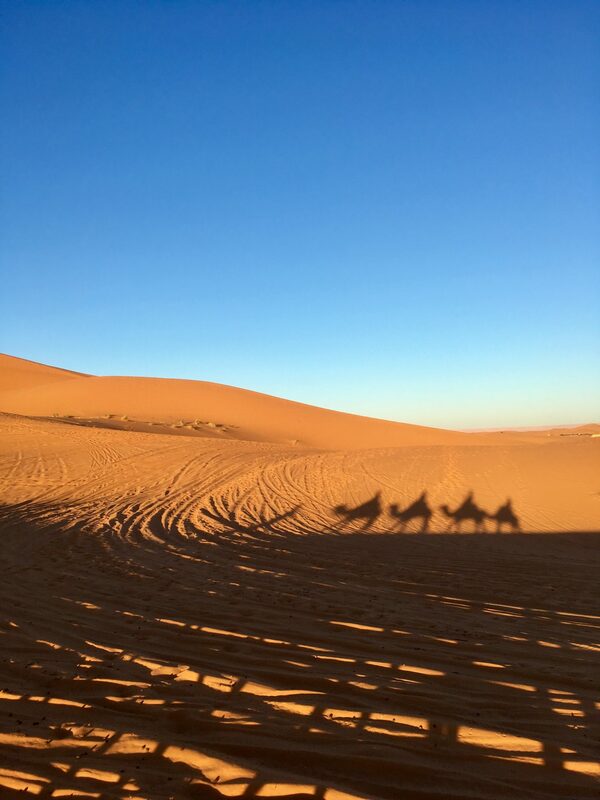 Our excursion was facilitated through Kasbah Riad Bouchedor, located in Ouarzazate, and our meeting spot was Palais des Dunes on the edge of the Sahara. At this point, we ditched the car and changed to camels for transportation along with a friendly guide named Yousef. The Amazigh language spoken here is Zenata Berber, which is one of the desert dialects that make up the language. For this reason, our driver Mohammed confessed he could not really understand the language spoken here; although, he is not Berber to begin with, but can understand it a fair some. The camels were an easy ride to camp, other than dismounting and mounting. And, the camp itself was equally as luxurious as our other accommodations. Although unheated, the tents had on-suite showers and toilets. Dinner was also provided. In this region of Morocco, turkey is more common as a dish as well, so look out for it on menus and any platters served. It is quite tasty breaded and fried! Although, what isn’t? A note about desert stays, be sure to pack warm clothing. As the sun sets, the temperatures drop. Although I was fine walking around with just a sweater, at night in bed, one can easily become too cold without proper layers. At night after dinner, we listened to traditional music played and exchanged jokes and riddles that the guides found interesting. I also tried to stake out one of the small shrubbery areas at night to see if I could spot any nocturnal fauna. These areas act as desert highways for small lives like jerboas, gerbils, feral cats, foxes, and sand cats to name a few. Like in the tundra, markings and other tracks from wildlife only change from environmental input (i.e. wind) and experience mild distortion, so when possible, look at the ground for prints, especially in the morning to see what actions occurred around the bushes. However, I did not get to see any of these cute critters unfortunately. The trip back to basecamp at Merzouga the next day was another easy ride; however, my parents rode back in the JEEP. Yousef, my sister, and I went back with the camels per the aesthetic. The sunsets and sunrises are brilliant, and the amount of stars in the Sahara, the world’s largest desert, are awe-inspiring. If one gets the chance, book a small excursion at all costs – it is worth the cross-country trip despite the camel smell! Out of the desert, back to actual roads! More to come about the interior and the southern Moroccan coast. Oh, how I miss Morocco (especially the food) and the sun! 12. Chile is not the country to bargain in.